The sale will commence tomorrow and last till October 17. Amazon is teasing upto 40 percent discounts on various mobile phone brands and is offering lucrative deals and offers on other gadgets as well. 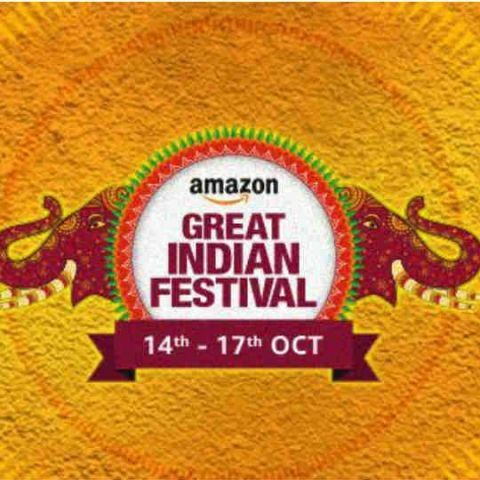 Amazon is back with another Great Indian Festival and is offering some exciting deals and offers across smartphones, mobile accessories and many other categories. The online retailer is hosting its pre-Diwali sale between October 14 till October 17. During the sale, Amazon will be offering a no-cost EMI option, cashbacks and exchange offers for buyers. Consumers shopping with an SBI debit or credit card will get a 10 percent additional cashback, whereas with Amazon Pay, buyers will receive a cashback of upto Rs 500. Amazon will be offering up to 40 percent off across various smartphone brands during its Great Indian Festival. Apart from the exchange offers and no-cost EMI, buyers will also get various telecom offers. Idea, Vodafone and Jio are all offering free bundled data with the purchase of select smartphones. Amazon is offering upto 65 percent off on power banks, whereas mobile cases and Bluetooth headsets will receive up to 80 and 20 percent discounts respectively. Coming to other electronics, consumers will observe up to 50 percent off on storage devices and up to 60 percent off on both speakers/headphone and PC accessories. Amazon will also bundle its Fire TV stick with offers worth Rs 1,000. Gaming consoles will receive a minimum price cut of Rs 1,800 and people buying laptops will get up to Rs 20,000 off as well. Amazon will also feature its “Blockbuster deals”, special Dhanteras offers and deals under Rs 499. Amazon app users will get exclusive access to the Golden Hour Deals, which will take place from 8PM to midnight everyday during the sale. The online retailer is also touting the conclusion of its Amazon Prime membership discount. It is being offered at Rs 499 for a year and will soon be increased to Rs 999. Amazon Prime members get an early access to flash sales and deals and also get access to the e-commerce site’s Amazon Prime Video services. how can we get sponsorship from digit for college tech fest?